Shark teeth colors available are: White, Black, Gray, and Brown. Carcharodon megalodon, extinct great white shark is a big name for a large shark. Our rare 5.5 inch shark tooth, from an over 50 foot ancient fossil shark fish! Each shark tooth is a unique replica molded from an original shark tooth. Shark teeth color may vary, just like an original fossil tooth of natural history. Makes a great educational & unique gift to start or add to any quality collection. Collect this museum quality fossil great white shark tooth reproduction for a fraction of the cost of an original shark tooth of this quality. Museum quality reproduction with artist copyright. Please tour ChrisDixonStudios .Com for more information. "Cast Stone", a unique artist's blend of durable, high strength and nontoxic artists' materials. The cast stone makes a very realistic fossil, inside and out. Ancient 50-foot long shark ( 17 meters ), roughly, each inch of shark tooth equals ten feet of fish! 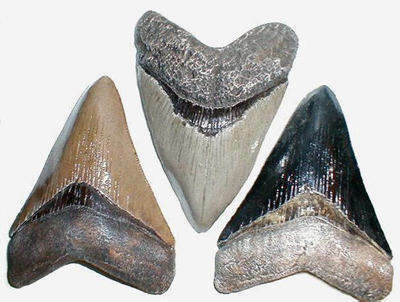 Some paleontologists believe that Megalodon should really be classified as 'Carcharocles megalodon' not 'Carcharodon megalodon' because teeth from the modern Great White Shark are quite similar to the teeth of the extinct 'Isurus hastalis' (right) but lack the serration in I. Hastalis. Fossil bones from big modern whale ancestors have been found with bite marks from the large serrated teeth of Megalodon.